Provide comfort for the family of Lucille Dean with a meaningful gesture of sympathy. Lucille E. Dean, 95, died Wednesday, February 6, 2019 at the Wichita County Health Center in Leoti, Kansas. 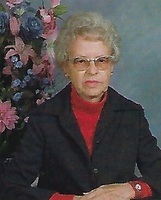 She was born July 28, 1923 in Dodge City, Kansas the daughter of Joe & Estella (Cummins) Knobbe. Lucille moved with her family from Dodge City to Marienthal, Kansas when she was a young child. She attended grade school at Marienthal and high school at Leoti. She worked as the bookkeeper for the Leoti Livestock Sales Co. for many years and was a member of St. Anthony Catholic Church in Leoti. On January 17, 1969, she married Jack Dean in Reno, Nevada. He died on August 24, 1976. Lucille is also preceded in death by her parents; 2 brothers Vern Knobbe and Jess Knobbe; a sister JoAnn Barrows; and a step-daughter Mary Henningson. Survivors include a brother Larry (Connie) Knobbe of Marienthal, Kansas; a sister Yvonne Schwindt of Ulysses, Kansas; a step-son Richard Dean of Osage Beach, Missouri; 2 step-daughters Patricia Hisel of Nekoosa, Wisconsin and Barbara Rich of Rolla, Kansas; and several nieces and nephews. A vigil service and rosary will be held at 7:00 p.m. on Sunday, February 10, 2019 at St. Anthony Catholic Church in Leoti. Funeral Mass will be held at 10:30 a.m. on Monday, February 11, 2019 also at St. Anthony Catholic Church in Leoti with Fr. Timothy Hickey as Celebrant. Burial will follow at the Leoti Cemetery. Friends may call from 6:00 p.m. to 7:00 p.m. on Sunday at St. Anthony Catholic Church in Leoti. The family suggests memorials given to St. Anthony Catholic Church or to the Leoti EMT’s both in care of Garnand Funeral Home of Lakin, Kansas. To plant a memorial tree in honor of Lucille E. Dean, please visit our Heartfelt Sympathies Store. My deepest condolences to the family for your loss.Truly heartbreaking. Our Heavenly Father gives us a beautiful thought when He promises us that soon death will be "swallowed up forever." (1 Cor. 15:54) Along with this, God also guarantees that ones who have died will be able to live again. (John 5:28,29) I hope these encouraging scriptures can bring you some comfort during this difficult time.